RetroRomIcon | Yesterday Is The Future! I’ve been back to developing (seriously) for around 6 – 7 months now. Pretty much non-stop, doing at least something every day. This isn’t my ‘full time job’ (though I’d like it to be someday), and I find time where I can. I’ve worked hard, and Vectoroids will be my 3rd game completed in (if I manage to hit my mark) under 12 months. For 2 guys (Zugget does my music, and now taking on sound effects – I do everything else) that’s not too bad… and more importantly we’re finishing things. The cool thing is that just finishing something gives you a little bit of credibility. Not a lot, but some. People start to take you a little more seriously. When I decided to get back into it after many years, many people were fairly stand-offish. I did a quick game to get used to working with Java and released it to my friends via facebook/google drive. This woke Zugget from his chiptune slumber, we’d worked together many many years ago in the Amiga days and been burnt together on failed deals, abandoned projects, and many other things, and so we teamed up for Sabotage. I’d hired another friend, Mike, a very talented graphic artist (who had also been burned with projects ‘on spec’) to take care of all the promotional art for me. With the release of the game, Mike seemed very enthuiastic to come on-board for the next game in a greater capacity. Just finishing things can help bring people onto your team – valuable, essential people who are willing to run with you just to be part of a process that goes all the way. It’s great! However it also puts you sometimes in a position of dealing with people who might not be armed with all the facts, or the reality of starting out in a complicated and hard biz. One I’ve had to take time out to deal with a few times now is what I call ‘the ideas guy’. When someone shows an interest in coming onboard I try and be as open and honest as I can. I let them know that we’re just a very small group of friends who work well together. That with only a single Android game on the market we’re still ‘in the red’. That being able to get along with us (and we’re a strange little group of likeminded, sometimes rash and abrasive, older guys with very dark senses of humor and no ‘censor’ button – two of us are Australia ex-pats) is every bit as important as what you bring to the table. And of course… what do you bring to the table? Myself, I’m an ‘adaptable coder’ – not a great coder…. but adaptable. I pick up languages very quickly, anywhere from a couple of days to 2 weeks, depending on the complexity. I won’t be great – but I can ‘get things done’ in that time frame, and can work on getting better with use from there. I was also a pixel artist way back in the 80’s – 90’s. I wasn’t half bad either… although I’m ‘ok’ with photoshop (I’ll leave that stuff to Mike) with pixel art making a comeback, I can still put those skills on the table. I can 3d model, and character animate. I also do all the game-design… which I like to think I’m getting better at. And if we ever get to the point where we start making trailers, I was a professional video editor for about 12 years in both TV news and production. Zugget is probably one of the most talented chip musicians I’ve ever known. Back in the 90’s I watched him compose, from start to finish, a chip tune for a demo with a spec of ‘run for 2 mins and be less than 10k’ in under 10 minutes. To this day I can message him with ‘I want something like…..’ and within 15 mins get 3 examples back. Usually with a ‘don’t use this right away…. I’ll work on it’. On top of that he is very frank, honest, and forthcoming with opinions, suggestions, and criticisms. If you want someone to blow smoke up your arse and make you feel good.. Zugget (or me for that matter) isn’t your guy. If you want brutal honesty that will make you better and push your product forward – he’s your guy. So when I ask someone ‘ok, what do you hope to get out of this? and what do you bring to the table’. The words ‘Well…. I’m more an ideas guy – but my idea will make you rich’ doesn’t get my blood flowing and my heart pumping, and I’ll cover that in a second. But ‘I’ll make you rich’ doesn’t move me. I’m motivated by the love of the game – the challenges of the code, and seeing my work come to life on the screen.. that’s what motivates me through the really hard and tedious work of actually finishing a project. “I can’t tell or hint at what my great idea is, because you might steal it… “. Now I understand the sentiment entirely. You want to protect your property, and being an ‘idea’ it’s hard to protect… but understand that on the flipside you’re approaching me right off the bat as someone shady and untrustworthy. It’s safe, but it doesn’t put us on a good starting basis. If you distrust me, why do you want to work with me? You’re better served by finding friends or acquaintances that you do trust. Also one thing I’ve found so far is that holding your cards close to your chest in this industry is actually a bad move. Hype early, hype often. Build interest. Advertising starts at concept and prototype. I’ve seen guys put an idea on a website and had people come to them to help make it happen… maybe you’re going about this the wrong way? Now what do you bring to the table? Apart from your idea? Because on a shoestring budget with a starting company of a couple of guys (each determining their level of involvement because Lord knows I can’t afford what they’re worth) I need more than an ‘idea’. I have ideas. Maybe they’re not as good as yours.. I’ll never know. For everything I work on, I have probably 10 – 15 ideas for something else. Many of these I throw away.. I end up with maybe 7 or 8. This isn’t uncommon. One of the biggest hurdles starting game developers have is finishing the project at hand, rather than running to the next big idea they just had….and from that one to another…and another… leaving a string of unfinished projects. I have a folder that has 28 fully developed game ideas in it. Some totally fleshed out, a couple even have little prototypes of a key mechanic. I jot them down and put them aside so they won’t distract me from the project at hand. Your idea, no matter how great, would be 29. Provided I don’t have MORE before I finish this project. If it took 6months to develop and polish every one of these, it would take me nearly 15 years to get through them all – provided I didn’t have a single other idea between now and then. By the end of this year I may have more ideas than I have productive years left in my lifetime. This isn’t even counting the other 2 guys. Not trying to put anyone down, you may have the best idea on the planet – It might make anyone associated with it a millionaire. But the reality of it is, and I don’t think my situation is that uncommon, you’re going to have to bring something else to the table just to be heard. And this isn’t uncommon either.. go back to the top of the article and browse it quickly… See? In more ways than one… February is on the way out, and that brings us 2 months into a projected 4 month dev cycle for Vectoroids. To tell the truth I would have liked to have been a lot further along than I am, but when you’re essentially a one man band (with help for music and sound) with other responsibilities to meet, you’re going to have slow months. As it stands there is quite a lot of the base code done – many of the arcade elements are done, and hopefully modular enough to allow me to plug in content at a later date and have it ‘just work’ with very little modifications. Work has begun on the strategy part of the game, and that will require a lot of careful coding and decision making – or I’ll pay for it with a lot of reworking down the line. 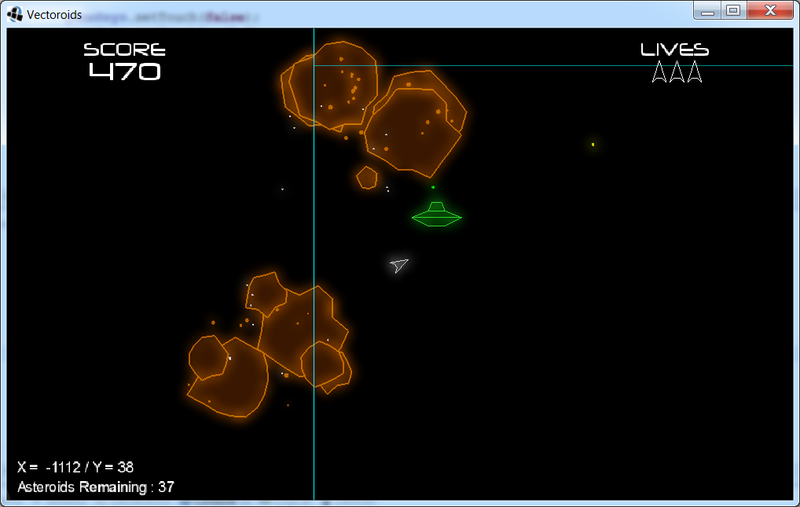 My goal for March is to have at least the quadrant/sector mapping system up and working. The ability to go to and from the strategy/arcade elements of the game, and have the procedural generation of sectors at least working, along with mission generation. It’s a big ticket to write, but it will really start bringing this game together. I’m trying to keep up to my posting at least every Sunday, and I’m trying to keep to that. But I keep telling people I can either write about developing this game or I can develop it. That’s the way it is when you’re a one (well with Zug doing the music and sound 2) man band. So, yes, it’s still looking to the naked eye a lot like Asteroids. Mainly because all the bits are in place for the classic game, so they are being expanded to use in the ‘proper’ game, and later I’ll be able to start adding more content. This is still very much the foundation of the game itself, and it needs to be solid – and as close to flawless as I can get it. It needs to be able to be built upon, and as this area – the sector – is where most of the action takes place, it needs to work well and fast. For the most part the elements that will drive the game are in. They may vary in their prettiness, but most of them are working the way they should. The action takes place on an infinitely wrapping area (the sector) that can be from 3 x 3 screens big, up to as big as I’d like. The larger the screen size, the more you lose the ‘claustrophobic’ feel of the arcade, but for later areas this will also allow me to diverge from the standard fare of Asteroids and do things that wouldn’t have been possible. The ship and camera are set to the center, and the traditional ‘slow breaking’ of the original game has been done away with in favor of a frictionless space. There is still a max velocity, for game purposes. Bullets (atm just plain) follow your velocity as they should – there is a little tweaking for aesthetics, but for the most part they behave as you’d think they should. The big under the hood setback that needed working on was something I had overlooked initially. In the past I’ve done scrolling games, but I really didn’t think about ones that wrapped back on themselves in all directions in such a small space. This lead to complications of things vanishing as they wrapped, collision detection problems that needed solving, and other issues… Now that they’re take care of, it’s a matter of making sure all screen elements adhere to this, and make it as easy as possible to add new content later. The HUD is done, and is rock solid – so I can start adding information and touch screen controls later. With this base getting closer to the way I want it to work, I can (hopefully) in the weeks ahead start getting to other areas of the game, and we’ll be able to watch it slowly slide away from it’s inspiration, and more towards being it’s own game. By the time this is printed I would have re-written it from scratch 3 times.. I’m pretty sure I didn’t hit all the points I wanted – but each time it started reading like a screed of things I don’t like with the current system… Way too negative. So how do you comment on something that you find so negative without devolving into that pool yourself? Welll… I tried. I took time out from Vectoroids development to address in app purchasing and registration. 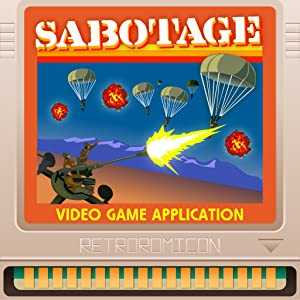 It’s something I need for this game, and Sabotage was released as a ‘paid app’ – it actually didn’t do too bad as a first release with no real marketing behind it, but I thought some kind of free version was a smart move – after all I like to try things before I buy, and that is my litmus test for a lot of my choices. So how to do it? Looking into it it seems that the going ‘free game’ method is to throw in ads and recoup the revenue of the game and have an in app registration with ‘no ads’. Maybe a pause for 30 seconds with a pay to continue…. Easy right? So why didn’t I do it? Many factors – number #1 being ‘Oh I love pop up ads…said absolutely nobody …. Ever.”. If I don’t like it, why would I do it to someone else? I know the reasoning behind it, and I know why ad viewing times require people to put them in places where they aren’t just skimmed over… and of course they need to get some revenue back – Harlan Ellison says ‘pay the artist’, and I agree with that. I have no argument with these things. I just don’t want to do them. I don’t want revenue gained from customer frustration – I don’t want to clog game mechanics with ads – and I don’t want to annoy people into buying the game… It’s a simple game, I think it’s enjoyable, and I want it to be enjoyed. At the end of the day I guess I’d rather leave money on the table if it means that the end player has a better experience. So how am I going to get revenue? I decided to go back to my roots with the c64 and Amiga – a playable demo… only a bit more than that – more like a promotional demo. all the gameplay is there, but a few ‘nice to have but not essential’ features are clipped, and if you want them you can register. None of these things (IMO) diminish the gameplay, but having them does enhance it. 6 of 15 attack waves – you get the first half of the game. And absolutely NO ads. or other annoyware. What about the ad revenue? I’m leaving it on the table and not touching it. Lord knows that is a hard decision to make.. Coz I certainly ‘aint rich. History may prove me wrong on this – but I’ve been around for quite a while, and I think there’s things in the game industry that won’t ever change… People who want to buy a game will buy it, and people who don’t want to won’t. No matter what you do. Back in the 64/Amiga days I had boxes and boxes of disks – of hundreds of games, many I played…. maybe three or four times. On a shelf I had maybe 20 games that I bought.. and I bought them no matter what the cost was. I mowed 3 yards to purchase Elite on the 64 (in Australia it was 60 dollars when it came out). Other games – nope, was never going to buy them. So, is Sabotage a game people will buy? I don’t know – quite possibly not.. it is a vehicle for my learning about the platform and the market. It stands up as a complete, fun, albeit small game – and I believe at 99c it falls into ‘I would play it 4 times at an 80’s arcade (5 in Australia)’. But ultimately I’m not really all that concerned. What I do hope is that people who pick it up will understand this is going to be my business model – my Modus Operandi. I want to build a customer base not on annoying or manipulating them into a purchase – that a purchase will give them something of value, more than ‘I won’t annoy you with ads’. I don’t like the current system and where it’s going. I don’t like ‘revenue is king’ as a silent partner in my marketing. I want to base my business model on respect. I won’t do to you what I don’t like done to me. And I respect your opinion to register, or not register any of my games. The onus is on me to create something you enjoy enough to buy, not on you to use your dollar to circumvent aggravation or frustration. In the end the commodity I want to peddle is enjoyment…. I think it’s a much more positive metric to gauge my own success or failure than revenue. My first game, Sabotage, is out and on Google Play and Amazon. It was a nice little project to cut my teeth on developing for Android, and much was learned. But there’s no rest or time for back patting – I suffer from more ideas than I can keep up with, and the next game selected is ‘Vectoroids’. I wrote an Asteroids clone last year in 2 weeks. A project on my ‘bag of parts’ computer, I had to use while my actual comp was being used elsewhere. It was a little project simply to write and finish a game – not a prototype, a demo, or just me messing around – but a finished game. I had planned on rehashing the project and putting out a version for Android, as several of my friends had requested it. Looking over the code after 4 months (the time it took to do Saboatage) I figured a complete rewrite was in order – But Vectoroids was a black and white recreation of Asteroids.. albeit (in my opinion) a pretty faithful one (I even recreated the font based on the noted from the original game) – but the market is swamped with them, and more importantly, I’d already been there and done that. I started looking at things that didn’t make it into Sabotage (which I did as a old school vector graphics game as well) such as muted color, perhaps a bloom shader to try and focus on the look of the old vector graphics monitor… I prototyped the original clone with these features, and started thinking about how Asteroids would be without the constraints of the arcade….. more enemies obviously, a bigger playfield, perhaps a continuation of the scenario. And with that I started jotting down ideas, refining them, throwing some away and now putting it into the game. 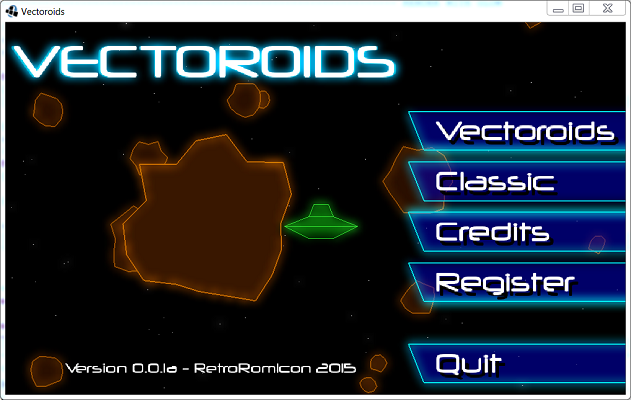 Vectoroids is an expansion of the Asteroids universe – there is an overall story and (will be) much deeper gameplay than what a clone has to offer (although am including a ‘classic mode’ for nostalgic appeal). Your carrier is hunting down an an alien base, entrenched in the heart of the asteroid belt. You pilot a small agile snub fighter that scouts ahead – clearing the sectors so the ship can progress through. These sectors are larger than screen areas that must be cleared of all asteroids large enough to harm the carrier – as well as carrying out scouting missions – eliminating enemy scout ships, gathering resources and intelligence to be researched (which will help you upgrade your ships). There will be several sectors to a quadrant, and the path you clear will lead you deeper into the asteroid belt. At the moment I’m working with 16 x 16 sectors to a quadrant, and 16 x 16 quadrants to the game (but this is subject to change). Missions, sector composition, and other things will be procedurally generated, which will hopefully add to the depth of the game as it will be different each time. Ship upgrades, R&D and other aspects of the ‘carrier’ part of the game I hope will give it more of an ‘elite lite’ feel – the scope of the project is much bigger than the 2 previous games, and I’m setting myself up with a 4 – 5 month goal. I’ll be keeping folks updated here, and with screenshots as the game progresses – at the moment I have up the current main menu screen – it’s all animated and, of course, done with old school vector graphics.